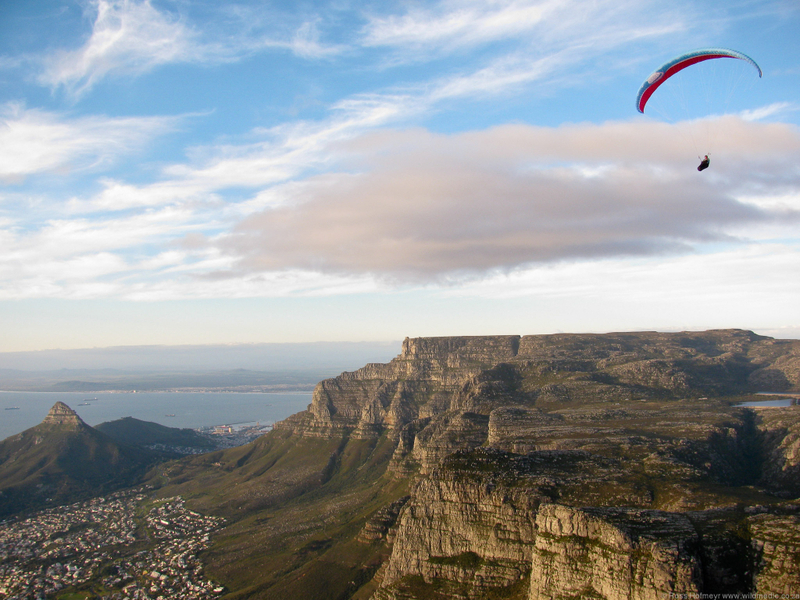 Avid blog-readers who have already realised that I will likely name my future children after paraglider brands will also know that I’ve recently completely refreshed my stable. 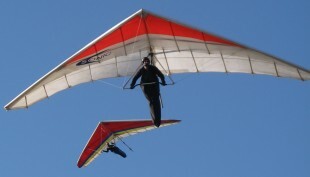 The wonderful and capable Swing Mistral 4 that has served me since 2006 went into hibernation last year when I acquired a MacPara Eden 4 for paramotoring, which (embarrassingly) outperformed the former glider in unpowered flight as well – no doubt due to a 5-year advantage in newer technology. The Eden is a great wing, and deserves its accolades as an ideal single wing for flying with and without power, but over the course of a year of paramotoring I came to realise that (like in free flying) I love long cross-countries and exploration, and the reflex paramotor wing technology has proven itself to be ideal for fast, stable, efficient flying. I began to research PPG wings, and test-fly everything I could. My desires: a wing capable of good top speeds (65km/h or more), which is still easy enough to launch that I can get away at altitude (5000’) carrying a full fuel load, DSLR camera and emergency supplies, and is fuel efficient. If possible, I wanted a wing that can be flown free (without motor) on occasion, so that I only have to take one wing on trips where packing space is an issue. 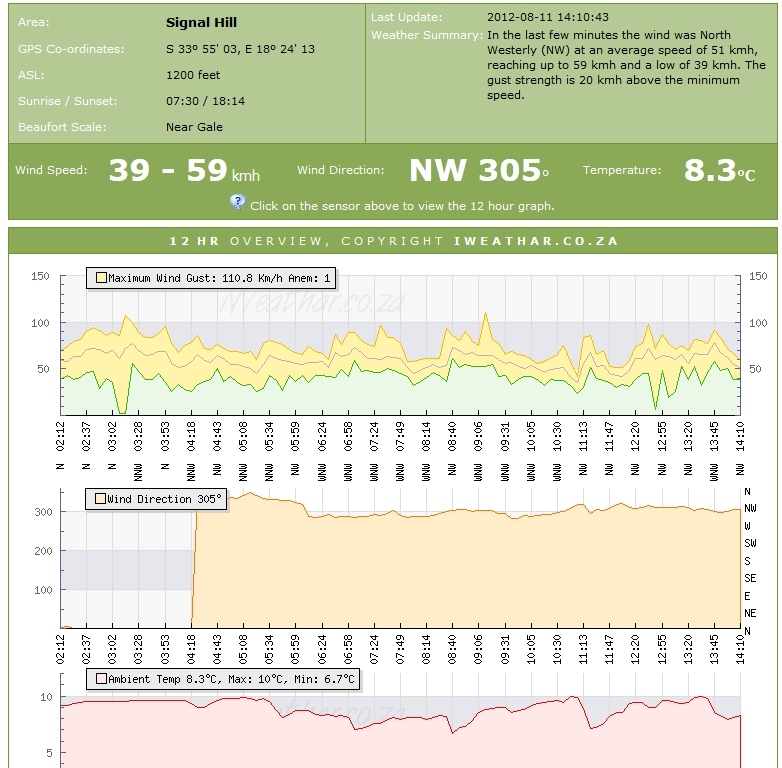 Real-time weather data for Signal Hill courtesy of www.iweathar.co.za, accesed 2012_0811 at 14h15. For current values, click the image. Come 10h15 we decided that the skies had decided to shift from nothing to light NE, and therefore the progression to N then NW could be expected. 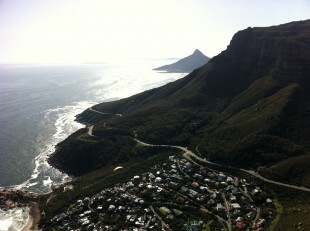 We embarked for Llandudno, leaving a car at the bottom, and headed up to launch. Gavin planned to meet us there, but Ian and Ant elected to aim for a PPG flight at Soetwater (near Kommetjie) instead. The short and pleasant stroll to take-off at LLH behind us, we found a strong breeze (perhaps 25km/h) at the mast, and after briefing Niel I suggested we move to the traditional takeoff, where it was a little lighter. 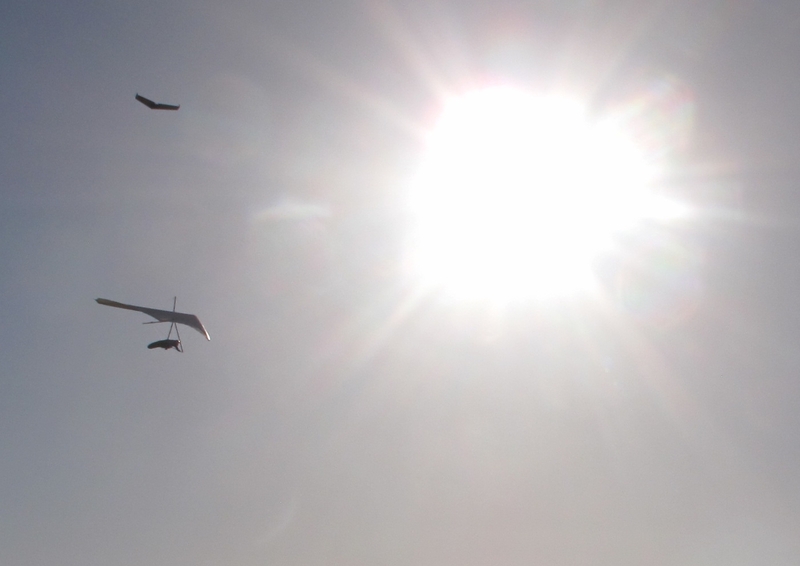 The wind was now a steady N. I launched and climbed easily, spotting Gavin on his way to the takeoff. Niel launched and was soon searing easily, but aloft it was evident that the expected NW wind gradient was in force, and he (sensibly, on a 1/1-2) elected to stay well in front of the mountain. Gavin was soon climbing, too. Due to my chronic itchyfootitis, I felt the compulsion to cross to Karbonkelberg, where the high north-facing cliffs promise easy lift to the wandering pilot. Before long I was kicking my heels above 950m of clear winter air, watching Niel and Gavin fly out to land at Llandudno beach. Both felt that their penetration was poor; I was in less compressed air (further from the Apostles) and still quite comfortable off speed-bar. 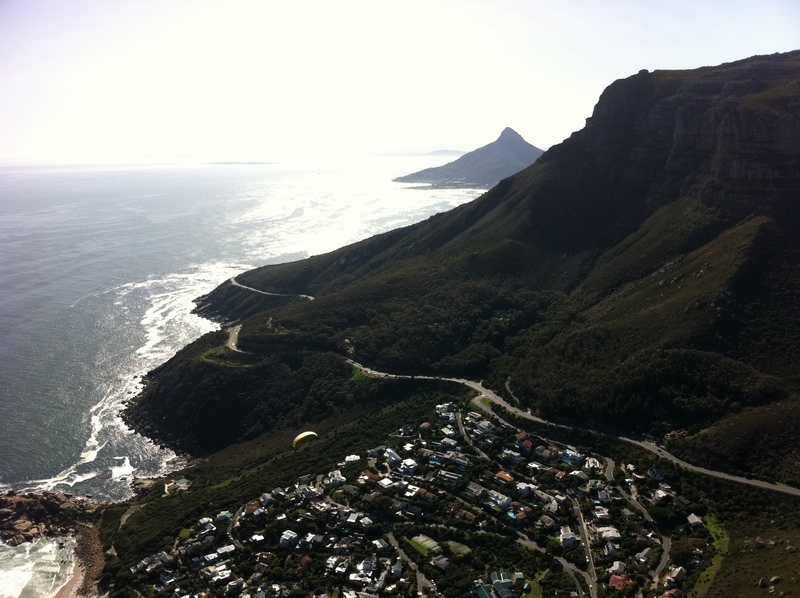 Trying to jump back to Little Lion’s Head, however, was not easy: I lost 250m for little real progress and scuttled back to the lift at Karbonkelberg. Clearly the very northerly wind precluded a run down the Apostles, so I was left with a choice: try hard to get back onto LLH, perhaps landing at Sandy Bay in the process (hardly a hardship unless the old-and-wrinkly brigade was out in force), or try something I’d been itching to do for a long time: go over the back into Hout Bay and fly further south. 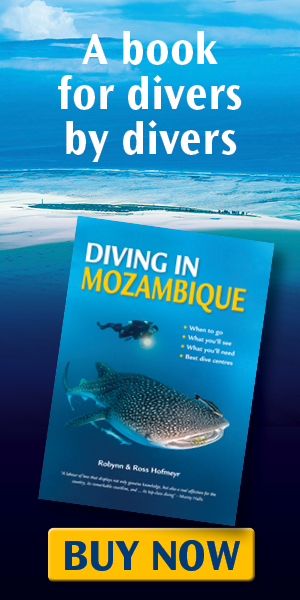 A quick radio call to Niel/Tessa confirmed that they were willing to drive chase (Tessa does really like driving the Pajero), and so Plan B went into action. 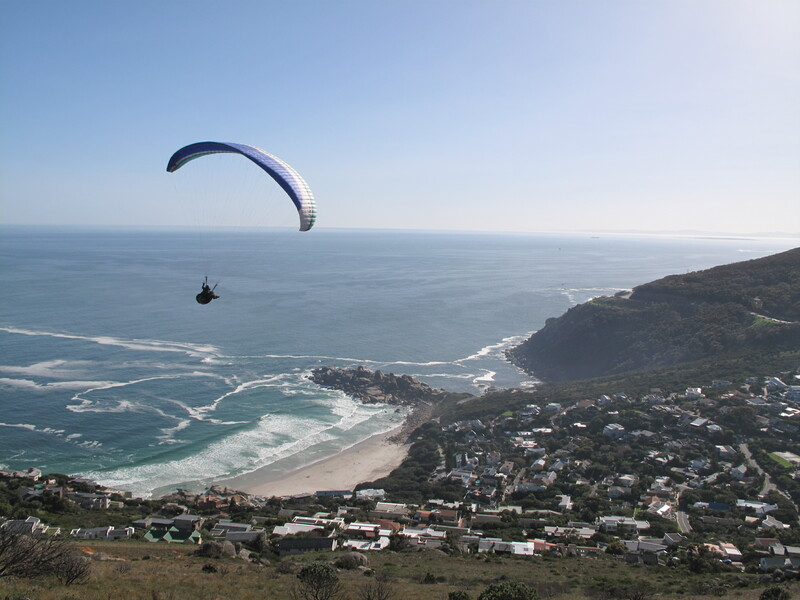 I plunged into the best lift over Karbonkelberg on half bar and climbed up to 950m ASL before slipping round the corner into Hout Bay (see the panoramic picture – click on the image for much more detail). The ride across the valley was swift and beautifully smooth, losing less than 200m altitude, and soon I could climb out again on the western flank of Constantiaberg. From 900m again I set off over Hout Bay itself, giving Noordehoek Peak a very wide berth (to avoid eagle disturbance) and aiming directly for Chapman’s Peak. 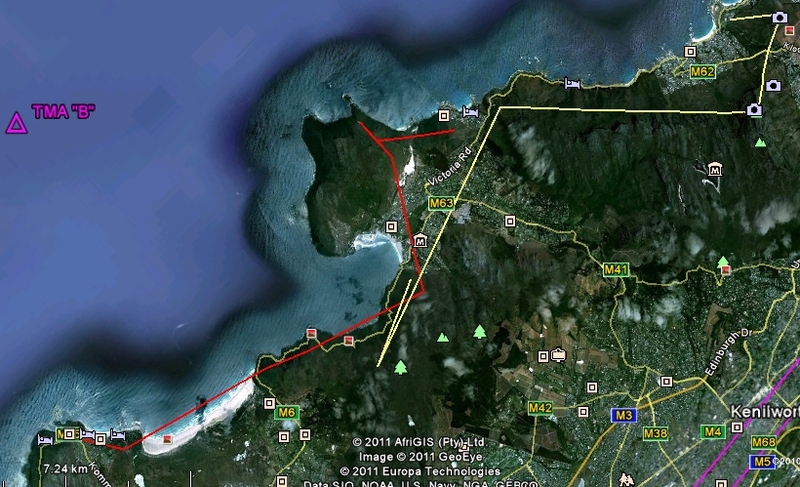 Arriving at over 700m, I didn’t find much lift, and so put the northerly at my back and headed for Kommetjie. 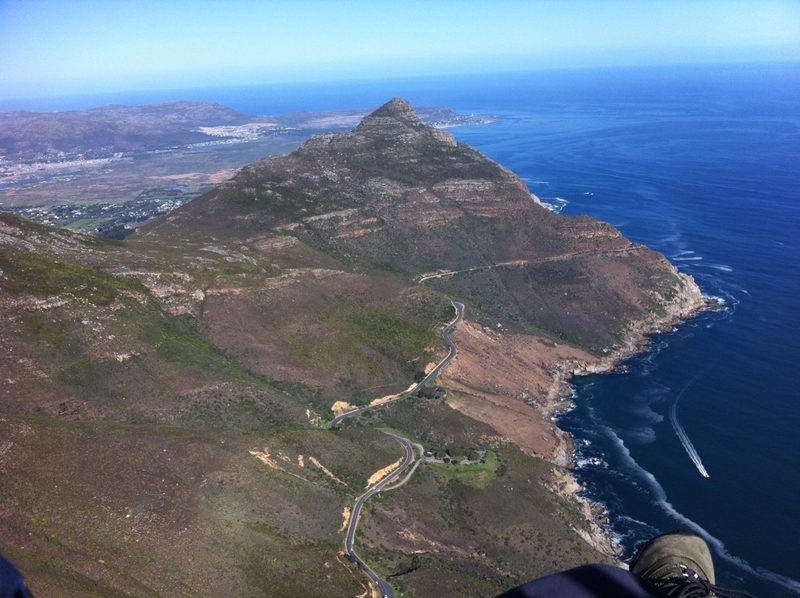 I had a vague hope of getting onto Slangkop and from there to Misty Cliffs, but although I went overhead Kommetjie at 300m ASL this wasn’t enough height to get lift again, so I landed near the main road… about 500m short of bettering Abe Meyer’s distance record (who narrowly beat Ant Allen… it’s a cut-throat world in the South Peninsula). Interestingly, if you look at the paths of my two last XC flights in the area (starting quite close but heading in opposite directions), both are almost exactly 22km. Curious. In any case, Tessa and Niel (bless them) were hot on my trail, and by taking a quick minibus ride I met them in Noordehoek. (“Vyf Rand Vishoek toe, Meneer!” “Wat as ek net Noordehoek toe wil ry?” “Net vyf Rand dan, Meneer!”). Along the way I was cussed properly by every PG pilot who phoned to hear how the wind was (Not mentioning names: you know who you are). It was by now blown out at LLH, but a light shone in the windy darkness: Adam West (chairman of the HG club, for those not in the know) called and was enlivened to hear that the NW had appeared, and was headed to Signal Hill. We deciede to go check it out. 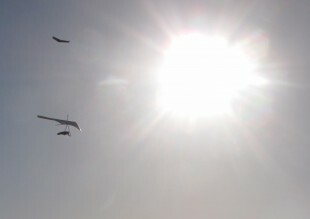 Needless to say, wonderful flying was had at Sigs (several tandems also in attendance) before the wind backed off and left nothing else to do but raise glasses to a great day down at Mouille Point. I still think I owe T&N more beers, but more is nog ‘n dag.